Debt can be a crushing burden. Just ask someone with a huge credit card balance or thousands of dollars in student loans. But what makes debt such a problem is the borrowed money must be repaid, along with interest on the debt. If you make only the minimum credit card payment or the amount due on your mortgage, you'll end up paying thousands of dollars in interest before you ever pay off the balance. Is there a way to do it faster? Yes, according to the experts at LendingTree, but it requires a little financial sacrifice. You need to pay a little extra on your loan debt each month, meaning you'll have less disposable income. But if you do that, the loan balance will go down faster. LendingTree has an interest calculator on its website so you can check out some different payment scenarios. First, let's look at a $10,000 credit card balance with an interest rate of 15.2% APR, making a minimum payment of $225 a month. It would take you five and a half years to pay it off and cost nearly $5,000 in interest. Now, add $200 a month to your payment, paying $425. According to the calculator, the time it would take to get the balance to zero is more than cut in half. You would also pay less than $2,000 in interest. Some people also pay extra on their mortgage each month. It not only pays it off faster, less of each payment goes to interest and more goes against the principal. Look at a 30-year fixed-rate mortgage for $230,000 at 4.9%, with a monthly payment of $1,230. But suppose you decided to pay an extra $100 dollars a month. Now, you will pay off the mortgage four years earlier and save $35,000 in interest. "The far better way to deal with debt is to pay it off as quickly as possible," the experts at LendingTree advise. "To do this, you’ll need to spend less, earn more, or ideally both. 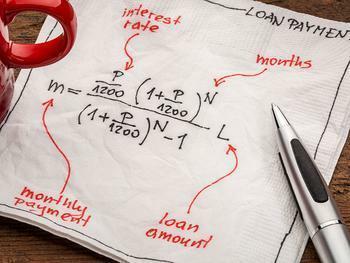 As you find creative ways to cut back and increase your income, you’ll want to make sure you’re getting the very best interest rate for the debt you do have." From a financial standpoint, LendingTree says the "avalanche" method of debt repayment, paying off the loans with the highest interest first, regardless of the loan amount. The "snowball" method is where you pay off the debt with the smallest balances first, working up to the largest balances. Both methods, says LendingTree, are better than the traditional method -- just making the minimum payment.